You know when you are invited to a potluck and the host says, "why don't you bring some chips and salsa?" It's a crowd pleaser and it seems like most people can't get enough of chips and salsa. I think I am the minority in this. I like chips and salsa, but I don't love it. It's kind of like me and peanut butter- for the most part I could take it or leave it. But remember how I said I was obsessed with cherries? Yeah, they're pretty amazing. And a salsa with cherries in it? Now that is a salsa I can get behind. Not too long ago I had the most perfect pineapple in my house. I ate it raw, grilled it and simply stared at it with adoration, as it sat on my wooden counter top. When I had the opportunity to pair some of the pineapple with a lovely wild salmon fillet, I knew the cherries would be jealous if they were not included. Suddenly I was inspired and a new potluck salsa was born. You know what's great about making your own salsa? There are no rules. I think that is why I tend to yawn over store-bought salsa. Tomatoes, onions, peppers.... it's what you always expect. Nothing surprises me. So when you get a chance to make your own salsa, that's when your mind should open a bit. It's like a salad- what can you NOT put in it? For your homemade salsa, use sun dried tomatoes instead of raw tomatoes. Grill the peppers first! Caramelize the onions- or pickle some shallots first! MMmmmmmmmm the possibilities. Two tips I learned when cooking fish. 1) Always sear fish flesh side down to start 2) Fish will usually tell you when it is ready to flip. You know when you are grilling/searing a gorgeous fish and you try to turn it and half the meat is still sticking to the pan/grill? Such disappointment! If your pan/grill is hot enough and oiled enough, the fish should easily come off the pan/grill when the flesh has caramelized and is ready to turn. This is a really good rule of thumb for cooking all proteins. One word of caution though- fish cooks fast and can be easily over-cooked, AND it will continue to cook once you have taken it off the heat. Salmon and cherries are a perfect pairing though- especially with an Oregon pinot noir- oh wow. Suddenly your mouth is jaw dropping instead of yawning at another same-old salsa. Seriously, ditch the pre-made salsa and make your own already! Combine all the above ingredients except the olive oil and salmon into a mixing bowl. Stir gently. Add one splash of olive oil and taste for seasoning. Cover and refrigerate until ready to use. Lightly oil and season a salmon fillet with a splash of olive oil and salt and pepper. Place flesh side down on a cleaned and oiled grill or pan. Cook for 2-4 minutes depending on the thickness. Flip and cook for another 2-4 minutes. Salmon will be cooked when the flesh is no longer opaque. I tend to like it pretty rare, but it's your salmon- cook it how you want it! Top salmon with salsa and serve! Awhile ago, I organized a deep sea salmon fishing trip for Mark and some of his close buddies for his birthday. Mark loves fishing, but come on, this gift was just as much for me as was for him! In my head, I had these grand fantasies of him busting in the door on Sunday night with a weekend-long scruffy beard, holding an icy cooler packed with salmon, (all of course while still in his waiters). Sadly, the only thing Mark came home with was an icy chest of sardines! Only two of the six guys who went with him came home with more than that. Of course I was bummed we didn't get to eat salmon, but still just as excited we were able to eat sardines! Even though they are considered fish bait to some people, I'm just smitten about them. I can imagine the confused looks he got from his buddies while he packed the sardines on ice to take home. Are you really keeping those? After you have cleaned and gutted the sardines, they need to be scaled. Use the side of a sharp pairing knife to scrape off loose scales. Give yourself plenty of room as scales will go flying! Rinse and pat the sardines dry and set aside. Create a lemon-salt and liberally salt the fish inside and out. Let the fish rest with this salt coating for 20 minutes while you get the grill ready or make the dipping sauce. Reserve any remaining lemon-salt. After 20 minutes, rinse the salt off the sardines and pat dry. Liberally coat the sardines with the fresh herb olive oil and lightly season the fillets with remaining lemon salt and cracked black pepper. Lightly oil your gas grill. Turn heat to medium-high. Once grill is hot, add seasoned sardines. Cook for approximately two minutes on each side. Brush with any extra herb oil. The sardines will be cooked when the insides are no-longer pink and their skin takes on a golden-char. Because of their rich flavor, I like to serve sardines with a salad or grilled vegetables. Pickled beets or a cucumber-vinegar salad would really compliment the oily-richness of the fish and the dipping sauce. Pair with a dry rose or a chilly Riesling or Sauv. Blanc wine. Add lemon zest to salt and stir. Combine all the ingredients into a bowl and stir. Add more olive oil as needed to coat fish with ease. Add the egg yolk, lemon juice, garlic and Dijon in a blender or food processor (or use a whisk and elbow grease!) and pulse to combine. While the blender or food processor is running, slowly pour in the oils. Turn off the motor once the mixture has firmed up to the consistency of mayonnaise. Stir in herbs and capers. Adjust seasoning with lemon and herbs. Keep cold until serving. 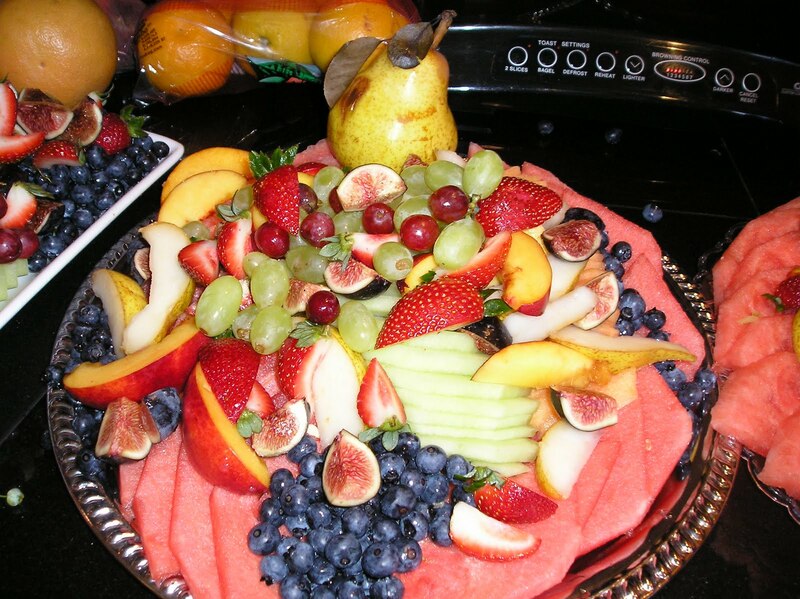 One of my favorite things to make in culinary school was fruit platters. Learning to slice cantaloupe, honeydew melon and watermelon into identical slices to create the perfect Crayola crayon box affect of cascading colors was more than knife skills, it was art. It was sculpture. I distinctly remember one night while working at Macina Bakery, and I was filling catering orders for the next day. Part of the order was to make several fruit platters and I got carried away. A fruit platter for 8-10 people turned into a platter for a small wedding party! The owner, Leslie came in the next morning and said, "We've had two different clients say there was just too much for their party, how big are you making these?" You can imagine how embarrassed I was. So yes, when it comes to making fruit platters, I tend to get a little too creative. Which means, I am bound to have leftover fruit after the party is over. That's when I break out the blender. My husband isn't overly interested in leftovers. He's spoiled. But I think that is where true culinary creativity comes in. Have you ever heard those radio shows when a chef has to come up with a dinner out of leftover ingredients a caller will say is in their fridge? It's hard! But deliciously fun. At one glance in my fridge, this is what I was looking at: 1 pint of week old strawberries, sliced watermelon and almond milk. One blender, 30 seconds. delicious. Talk about the opposite of sculpture. Combine ingredients in a blender, blend until pureed. I'm one of these people who takes full advantage of cherry season. The thought that I won't be able to eat cherries for another eight months after September is enough to create gluttonous and wanton desire for them. I don't know if there is a sexier fruit? The deep red juices alone are enough to speed the pulse. Besides eating them alone, I love making them into sauces. One in particular I like to make is a fresh cherry and rhubarb compote that accompanies grilled pork tenderloin rubbed with dried sage and fennel. It's a recipe from book 2 of EAT & DRINK in the Northwest. When Mark and I were invited to our friend's cabin on Herron Island for the Fourth, I knew I wanted to make this recipe. The grilled pork with the spice rub could easily be eaten on its own, but the combination of the caramelized sweet herbs with the tangy cherry sauce creates a whole new element. Herron Island is a private island that is only accessible by boat and home to vacation and retirement cabins mostly. Only residents and guests are able to board the small 12-car ferry boat that shuttles cars from Key Penninsula, near Gig Harbor, WA. And it's about the cutest ferry you will ever see. It's not crucial that you have a cherry-pitter for the fresh cherry and rhubarb compote, but I highly recommend getting one if you don't. Besides pitting cherries, it's fantastic for pitting olives too. During the summer, my cherry-pitter hangs out with the popular kitchen tools instead of at the bottom of my "Er" drawer. The pork recipe is a great one for a crowd. Pork tenderloin is unbelievably inexpensive and if cooked right, it can taste amazing. 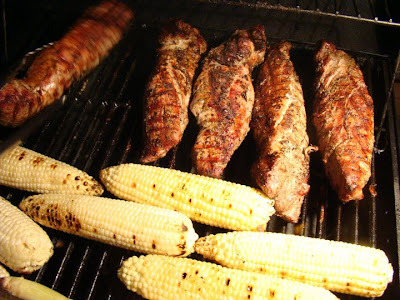 To accompany the pork, Mark and I grilled corn on the cob with sage butter and made a Sweet Potato and Chickpea Salad. I'm absolutely obsessed with the dressing on this salad- simple, creamy, tangy and packed with flavor. Lastly, Mark made Braised Pork Belly Bites with Blue Berry Sauce for dessert, based off my Braised Pork Belly with Wild Huckleberry Sauce. The pork belly bites were suppose to be an appetizer, but the longer the pork braises, the better it gets. So we decided to have it for dessert instead. Our dinner was a huge success and even received a hilarious slow clap standing ovation! It was a weekend that would be described in children's Golden Book story: a cabin in the woods with friends, long walks, phosphorescents in the water at night, blue skies and warm breezes and so much laughter. Combine 3 tablespoons olive oil, ground black pepper, salt, sage, and fennel in a small bowl. Rub pork tenderloin with herb and olive oil mixture and place in a shallow pan. Cover and refrigerate for 25 minutes. In a large oven-proof sauté pan on high heat, add 1 tablespoon of olive oil. Add tenderloin and sear on all sides until light brown, for approximately 5 minutes. Place the pan into the oven for 12-15 minutes until pork juices run clear and is slightly pink in the middle. Temp should reach an internal temperature of 145°. In a medium, non-reactive saucepan over medium-high heat, add olive oil, shallot, garlic and a pinch of salt. Cook for 2 minutes. 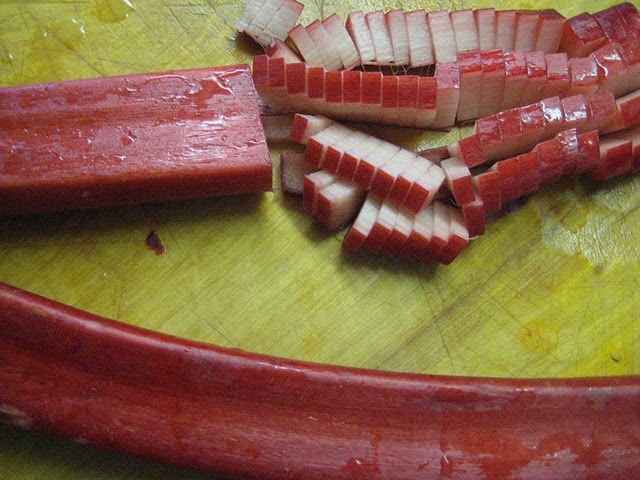 Stir in wine and rhubarb and cook for 2 minutes. 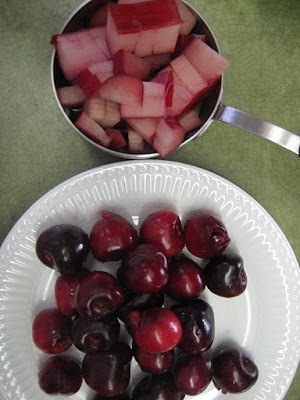 Add cherries and cook another 2 minutes. Add chicken stock, pepper, bay leaf, sugar and star anise. Reduce heat to medium-low and simmer for 20 minutes.